White Russian forces are victorious in the Russian Revolution, squashing the Bolsheviks. After British interference in neutral shipping and at the agitation of Irish immigrants, the US enters World War I -- on Germany's side. The Congressional vote to annex the Republic of Texas fails and Texas continues to be an independent state. What alternate history scenarios would you like to read about? Sidney Reilly's plan to overthrow the Bolsheviks and make himself dictator of Russia. That would have been fun. More fun than the Bolsheviks staying in power, for sure. It would be interesting to peer into a current world where 9/11 and the Iraq War never happened. Also: Queen Elizabeth fails to defeat the Spanish Armada. Spain controls... well, the world. How about a history where a famine led an emigration from Africa. If that was the case we may have found blacks already in the Americas. "The Congressional vote to annex the Republic of Texas fails and Texas continues to be an independent state." Sliders had an episode like this. It was mostly an excuse to put Quinn in a Western though. I came up with an idea once where the point of divergence was during the American Revolution; boiling down to the invasion of Canada was successful, leading to Canada (i.e. Quebec/Ontario) and Nova Scotia joining the revolution. (In real history it almost happened in NS; at least depending on your definition of "almost".) After the war, the Fifteen Colonies signed the Article of Confederation largely the same as actual history, but when it came time for the Philadelphia Convention in 1787, the addition of two more parties meant the Convention wasn't able to agree on a new Constitution, and the US continued under the Articles for awhile until eventually falling apart in the 1820s. The upshot being many more countries in North America in the 20th century (including an independent Republic of Texas). Never got as far as working out what the implications of this was on WWI (and therefore WWII). Plus there's the fact that even when I work out the history, I don't really have any ideas for a plot for a story, so the thing never went anywhere beyond some maps and timelines. John Lennon wasn't shot and went on to become the US' first British born President. Ringo would be the vice president. The Beatles reunite long enough to play at Lennon's inauguration (where a weary Lennon messes things up by calling the Wings a doofus band). Concern about a new "british invasion" is allayed when he turns out to be more popular than Reagan. Oooh, better still: The point of divergence is EARLY in human evolutionary history - we retain a tail and feet with the opposable thumb/toe. Otherwise, history continues per normal (with the exception that pants are invented with tail holes and shoes are less desirable). Sidney Reilly's plan to overthrow the Bolsheviks and make himself dictator of Russia. I hadn't heard of him before. He sounds a bit like William Walker of Nicaragua, only more competent and ambitious. Turtledove has done that, but I haven't read it. Here it is. I think that I'll watch it this weekend. Kevin R, that sounds like a great idea. Certainly an early breakup of the Republic was possible, if not a likelihood. Dan, this would of course require a Constitutional change, but it could prove interesting. Like Madonna becoming pope. 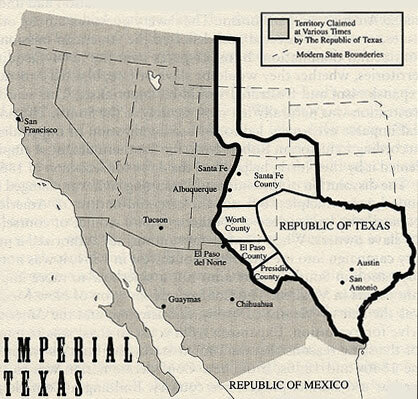 Had Texas remained a republic, the US west would have been the land gained by the Louisiana Purchase. Texas would have been a barrier to westward expansion of the US. Mexico still owned the lands that make up New Mexico, Arizona and California and would probably had claim on Nevada and Colorado as well. Both Russia and England had plans for the northwest, so Washington and Oregon could be either and Wyoming, Montana and Idaho would in all likelyhood be Canadian provinces. Would Mexico be able to keep the lid on the California GOld RUsh in 1849 or would they have another Texas situation on their hands? WOuld the additional Mexican territory added significant wealth to Mexico? Would the absence of meddling northern neighbors led to stability in the Mexican society and government? Would the added Canadian territory to the west have sifted the balance of power in Canada from the east to the west? Would the US be the second, third or even fourth most successful nation in North America? Lots of room for speculation.